Week 13 already! I hope everyone has a great holiday weekend – Happy Thanksgiving! Today’s photo was taken on the Napali Coast, and shows a small portion of Kalalau Beach on a nearly cloudless day. 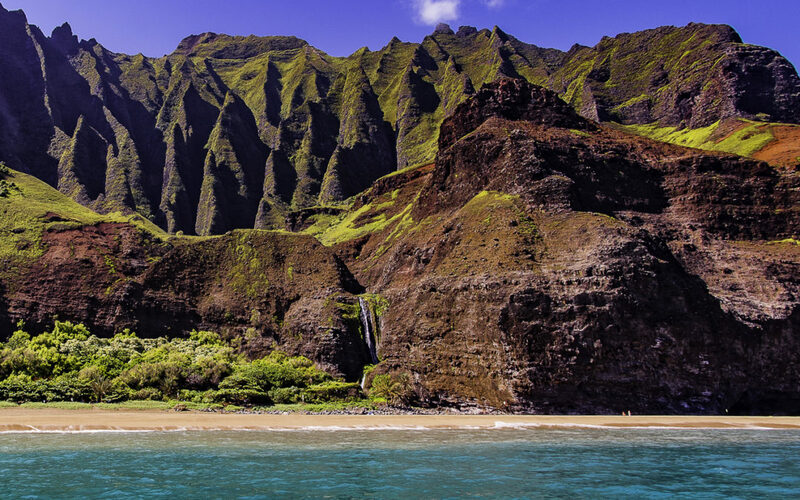 Kalalau is one of the most beautiful beaches on Kauai, yet one of the hardest to reach. Although a scenic lookout can be reached through Waimea Canyon, the only ways to experience Kalalau firsthand are by boat or hiking. The hike has been touted by National Geographic as one of the top hikes in the world, however it is not for the casual hiker – 11 miles of rugged terrain, including “crawler’s ledge,” a section of trail barely wide enough to hike but providing excellent views of the crashing surf far below. Private boat owners are able to moor outside and swim to the beach during the summer, which is a great way to see the beach, valley, and waterfall without hiking in the supplies for camping (camping is by permit only). As many of my friends know, I am bogged down this month with NaNoWriMo, and am a little bit behind. So this week (and probably next week) I’ll just leave you some links to these places instead of writing out a lot. Kalalau is an incredible place, and I hope you get to see it for yourself. The hike is absolutely worth it, just pay attention to weather, pack out your trash, and if crossing a stream looks dangerous don’t do it! This photo was taken with a Nikon D750 with 16mm fisheye lens. Check out Week 12 of my challenge.